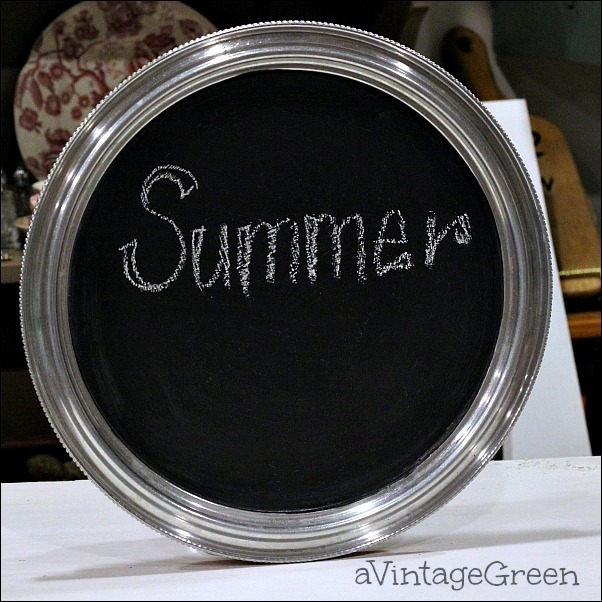 Time to mix a few vintage collectibles with a chalkboard painted vintage tray. 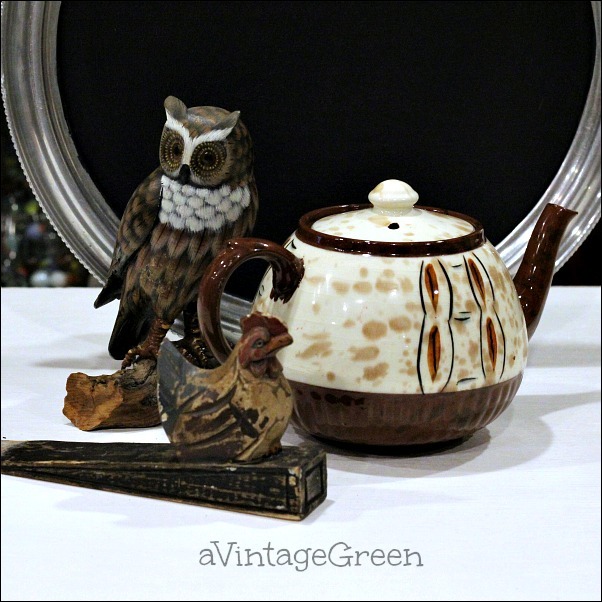 The teapot is Kensington, the owl hand painted wood and the doorstop is a memory of the 70's. Chalkboard paint, three stages - painted, chalked and wiped. The base is a faux wood grain laminate with a metal frame. 3 coats of chalkboard paint, dried well between coats, chalked when very dry and polished with a rag to make the new chalkboard ready to use. This tray has a hanger on the back. It could be used for signs, for naming cheeses at a party, as a tray for serving, a sign on the wall; imagine. As always, when using chalkboard paint, be sure to wash any paint that you get on yourself as well as your brush as soon as possible. This paint dries quickly and is not at all like chalk paint. It sticks and needs quite a bit of scrubbing to remove. 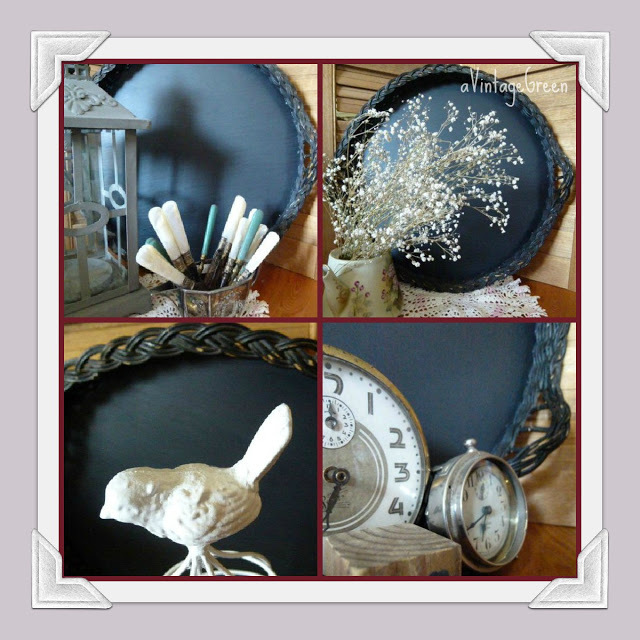 Check out an earlier post on using chalkboard paint here. I've borrowed a picture from that post. I loved the wicker tray, so versatile. The collage was framed using Picnik. I loved that online software program and was so sad when it was gone. PicMonkey thankfully developed their software and is now my favorite collage program. PicMonkey has provided easy to use and very versatile online software for making collages, editing, making photos look great. I really like the tray painted with chalkpaint. It looks really nice against the silver. I've been finding a few round trays myself and might paint one too! I love Picmonkey too! I am a Pic Monkey Junkie too! Love the vignette you styled with the chalkboard tray. Good morning, I like PicMonkey the best too. It is super easy to use! Your vignette is pretty with the chalkboard and I love the owl. Have a happy day and new week ahead! I love your tray idea! Lovely pictures! Using chalk board paint on the tray was a great idea! Lovely vignette and the Kensington teapot is a winner! Happy Monday! What a creative way to repurpose a cheese tray! I'm a mosaic newbie and have also found PicMonkey easy to use, although I still need to explore its other features! I love your tray!! I have not used chalk paint yet! Amber has and it looks really good on her projects! A unique tray and I love that tea pot and doorstop! I have some silver trays that could be repurposed this way, yours and the wicker tray turned out really nice. The Kensington teapot is a beauty. Joy, The chalkboard tray is great! The bird door stop is cute. Sylvia D.
The trays are fun Joy and can be used for so many things. I Love the doorstop! Thanks for sharing with SYC.